The McIntire Department of Music produces over 120 concerts annually, bringing the innovation and diversity of our academic mission to the public. 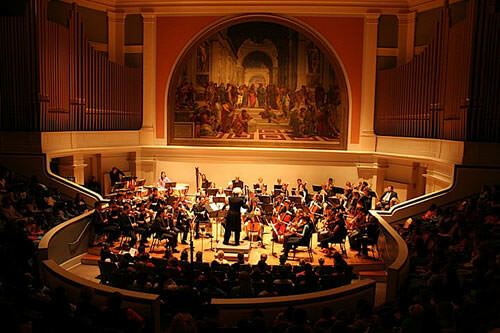 Our concerts are a vital part of the creative arts programming at the University of Virginia and in the Charlottesville community. Last year over 27,000 people attended Music Department concerts. From student recitals to faculty ensemble performances to concerts created in collaboration with world-famous guests, our concerts span a broad range of genres and styles. Musical diversity is a hallmark of the UVA Music Department's programming, and our resident groups reflect that. Our ensembles, such as the African Music and Dance, Baroque Orchestra, Wind Ensemble, Klezmer Ensemble, New Music Ensemble, Percussion Ensemble, Jazz Ensemble, Bluegrass Workshop, Mobile Interactive Computer Ensemble (MICE), all perform concerts each semester. And our larger groups such as the Cavalier Marching Band, University Singers, and Charlottesville Symphony perform to many sold-out crowds. Our faculty ensembles such as the Free Bridge Jazz Quintet, the Albemarle Ensemble, and the Rivanna Quartet regularly perform dynamic concerts to large audiences in Old Cabell Hall. Our Digitalis Festival, TechnoSonics Festival, and Chamber Music Series resonate across UVA's Grounds and in the Charlottesville Community. This page is designed for you to easily peruse the series of events we have to offer, but please consult our calendar page for further information about these concerts and all our other musical offerings at UVA.